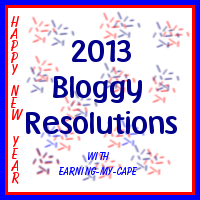 Earning-My-Cape: Bloggy New Years Resolutions! I usually don't, but this year I decided I would do a take on it. There are some things that I have been putting off doing wanting to do with my blog. I thought that putting them "out there" and sharing them with you would be just the kick in the pants motivation I need. If you are a blogger, and you have your own Bloggy Resolutions post, I'd love for you to share by linking up to the Inlinkz at the end of this post. Fine Tune My Blog Design- There are a lot of little things that need to be cleaned up around here. The changes won't be big, but hopefully they will make things a little tidier here. Update My Pages- This is something that I have already started, but need to finish. I plan to have a visual directory on each page with thumbnails for easier navigation for my readers. I hope to will keep it updated weekly. Be More Active in Social Media- I will update and connect more with my readers via social media. If you don't already, you can follow me on Facebook, Twitter, Google+, and Pinterest. Giveaways- I just have so much fun with giveaways, and I love "giving back" to my readers, so I hope to have more super exciting giveaways this year! Weekly Crochet Square- For my crochet friends- I am planning on making a square a week and sharing it with you. At the end of the year... well, probably the beginning of the next year... I will bind those squares into an afghan, and share the final product with you! I hope that some of you will crochet the year-long afghan with me! Monthly Newsletter- I am toying with the idea of a monthly newsletter, of sorts. This is basically just a recap of the month's recipes, crochet patterns, homeschool activities, and travel tips... or whatever else I've had going on that month. I'd love some feedback on that. Would you be interested in a monthly email from Earning-My-Cape? Bloggy Girls Club Blog- I want to get my second blog up and running! I started the Bloggy Girls Club group on Facebook a few months back, and it has turned into such a wonderful resource to many bloggers. I feel the group deserves a blog of it's own, so look for some exciting things to come over there. If you'd like to join the group, you can request to join HERE. You can visit the blog (in progress) HERE. There you have it. Short and simple. What resolutions (bloggy or not) do you have for this year? Great Goals for 2013! I have not given any thought to write down some goals for my blog. Even though I do have some in my head.